A bunch of aliens show up near Earth in a space ship that looks like it’s made out of bees and are promptly stomped by Gamera. A second batch of intruders show up and decide they need to get rid of the giant turtle monster before their planned invasion. Meanwhile Masao (Tôru Takatsuka) and his friend Jim (Carl Craig) are tooling around in a submarine when they run into Gamera. Little do they know that the aliens have plans for them as well. 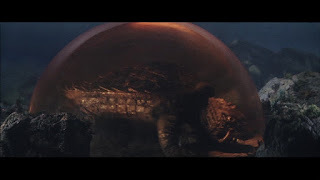 Even though we are faced with a kid’s movie starring some precocious youngsters who outwit every adult and have all the answers, Gamera vs. Viras still slips in some unsettling moments. The aliens have eerie glowing eyes, and detachable limbs. The most startling moment comes when these seemingly humanoid aliens are decapitated and it’s revealed they don’t look like people at all, they just wear the skins of humans that they have captured. This is punctuated by the sight of alien tentacles squeezing out of neck stumps. 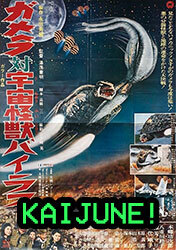 Gamera films tend to contain a little more horror than other kaiju films from the era and Gamera vs. Viras is no exception. Visually, this entry is a big step down from previous Gamera movies. The story is relegated to a few cheap sets, mostly a beach and the interior of the Viras space ship. Far more annoying is the shear amount of reused footage from other Gamera movies. For a ninety-minute feature, a solid fifteen of those minutes are spent in flashbacks to Gamera’s battles with Barugon and Gyaos. Not just moments from these battles but entire long scenes. It’s padding of the worst sort, and forces a film that was building towards some kind of momentum, no matter how mild, to a dead stop. To further insult the audience we are also treated again to Gamera destroying a dam in a scene recycled from Gamera vs.Barugon (1966). "Boo-bees! Get it? Seriously though, I'm going to murder you." Our two child leads Masao and Jim are likeable enough on their own but once coupled with everyone talking about how brilliant they are, it starts to get a little grating. The aliens are largely silent only speaking to issue threats or get mad that their dumb plans are being undone by twelve year olds. 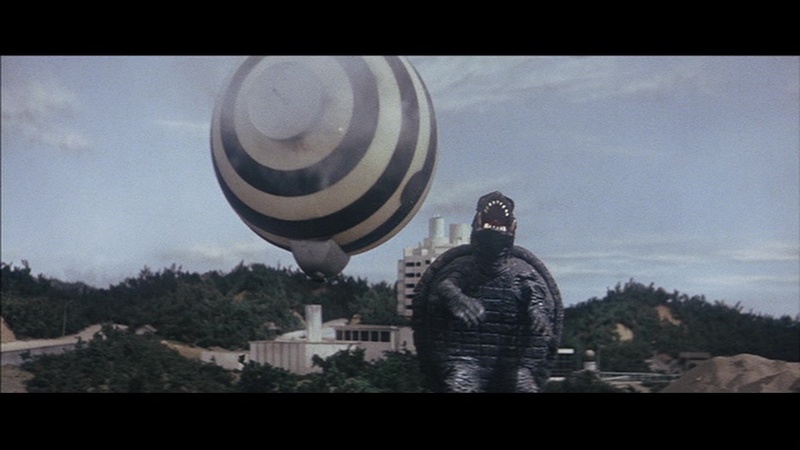 As far as the monster stars go, Gamera is pretty much what you expect. He receives quite a graphic beating at the hands (or pointy bits) of Viras. The camera lingers lovingly on Gamera belly as he’s stabbed over and over again while gushing green blood. That moment felt like the perfect cinematic encapsulation of bloody monster drawings made by kids the world over. Viras is almost an interesting monster design, he's sort of doubled ended silver squid. The only let down is the dopey face that is slapped onto the side of one of the tentacles. Gamera vs. Viras is a loopy mess of a movie that combines aggravating kids with some truly outré horror moments. It is a mishmash that alternates between fascinating and difficult to sit through. If you are in the mood for a weirdo kaiju film (and have something to occupy you for fifteen minutes in the middle of it), this might not be a bad one to try out.